Top Seller Takes a Trip! The Girl Scouts of San Gorgonio Blog reports that 12-year-old Dakota Gregory was the top fall product seller for Girl Scouts of San Gorgonio Council, selling $1,700 in nut and candy items. In recognition of her amazing accomplishment, the Council flew Dakota and her mom Dani to Waukesha, Wisconsin in August to visit the actual factory where the nuts and candies are made. Because she was wearing her Girl Scout vest on the plane, Dakota immediately caught the attention of the pilot, who invited her to join him in the cockpit. The captain put his hat on her head, and invited her to take his seat. 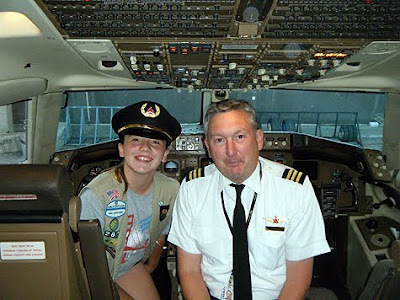 He talked with her about flying and explained what different buttons and gauges were for. She was impressed to learn that pilots had to retrain and re-qualify all the time in order to meet airline safety standards. At the factory, Dakota met by the Vice President, Mark Beveridge, who took Dakota and her mom on a tour to show them from start to finish, all that goes into getting a simple can of nuts. Dakota was invited to push the big red button that set the assembly line in motion. She was able to observe the nuts making their way down the line and see the machinery that roasts the nuts in peanut oil. Mark described the men who monitored this process as "artists" and explained how they are able to tell what needs to be adjusted just by the color of the nuts coming out.